What kind of bathing suit would the Doctor wear? 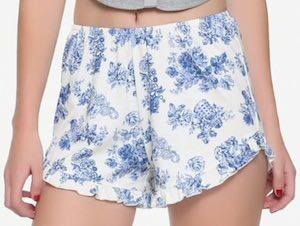 Maybe Doctor Who would wear these board shorts that have many pictures of his beloved Tardis on it. These men’s swim trunks have a blue waistband and under that white fabric that has pictures of the Tardis in different blue’s and even some of them are upside down. And on the back these Tardis shorts have a pocket with drainage holes so that your Tardis key has a place to go to. You can get these Doctor Who swim shorts in sizes Small – XL. 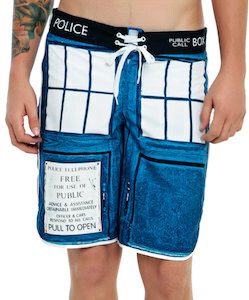 Get ready for a day at the beach or a swim in the pool with these Doctor Who Tumbling Tardis Board Shorts. Summer is the time to go to the pool or beach and that means you need some cool swimwear to wear. 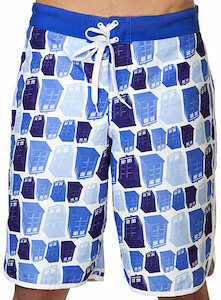 And Doctor Who fans can now get some amazing swim trunks that looks like the Tardis. The front and back of these board shorts looks like the doors of the Tardis and the waistband has the typical “Police Public Call Box” on it. You can get these Tardis swim shorts in sizes Small – XL and they even have a fly and pocket making them also perfect to do as “normal” shorts.